Though the quest for consensus may often seem like a hopeless case, there is growing agreement on one issue at all points of the political spectrum. According to a recent ABC News/Washington Post poll, 80% of Americans are “dissatisfied or even angry with the way the federal government is working.” Sadly for our “wise” Washingtonians, the bad news doesn’t stop there. The study, which traced government dissatisfaction since 1992, found the statistic to be at its highest point in nineteen years. Perhaps the most humorous indication of this truth comes from a different poll conducted by CNN in July, where 77% of Americans were found to believe that their elected officials acted more like “spoiled children” than “responsible adults” in the recent debt ceiling debate. I think the time has come to scale down the children’s federal playground. Indeed, given the current size and scope of our national government, this deadlock of dissatisfaction should come as no surprise. The United States is the third most inhabited nation in the world, with over 312 million people residing within her borders. Furthermore, its citizenry represents a rather heterogeneous slice of the world’s population, with every ethnicity, religion, and lifestyle imaginable. With such multiplicity of worldviews and a singular federal stage for them to be heard, great irritation towards such an inefficient political process is bound to arise. It is no wonder that Americans receive the same unsatisfactory quasi-socialist product of endless wars, runaway entitlements, and corporate welfare year after year regardless of which political party is in power. With no room for policy experimentation on the federal stage, moderation and compromise becomes the name of the game. As a result, all parties leave the negotiating table dissatisfied, and “change” becomes nothing more than a meaningless buzzword from an empty-promised politician. Fortunately, the Constitution provides an antidote to this ill-fated ailment. Indeed, I think “panacea” is a more suitable word to describe it. The Tenth Amendment, reserving “the powers not delegated to the United States by the Constitution” for the states’ control, provides the blueprint for a more streamlined political process that would lead to greater satisfaction for people of every persuasion.# With stricter states’ rights, policymaking would take place on a more localized level, thus empowering citizens with a greater voice in political deliberation. Engaged Americans could petition their local governments for laws customized to their community instead of a one-size-fits-all national “solution” being imposed on them from Washington, as is too often the case today through endless involuntary mandates, regulations, and programs. Best of all, states’ rights are viewpoint neutral, giving equal freedom for all ideologies to influence local legislatures and greater room for policy experimentation. Liberal states like California could pass progressive policies, while conservative states like Texas could enact more market-friendly solutions. Thus, instead of wasting their energy on bipartisan bickering in Washington, statesmen and citizens alike can channel their zeal towards productive policymaking in their own community, where they contain more local knowledge and are confronted with less hostility. As a result the United States would become true laboratories of democracy, as Supreme Court Justice Louis Brandeis so eloquently described them in 1932, where “a single courageous state may… try novel social and economic experiments without risk to the rest of the country” and thus policies of all shapes and sizes could be experimented. Indeed, even under the battered condition that the Tenth Amendment is in today, political activists on both sides of the aisle are still finding it to be a reliable vehicle to drive policy change across the country. On the Left, California’s 1996 passage of Proposition 215 legalizing medical marijuana has lead to greater legal acceptance of the drug. As a consequence of this “single courageous state” initiative and its peaceful results, fifteen other states have followed suit, empowering their citizens with greater individual liberty. On the Right, the drastic drop in crime rates seen in Florida after the enactment of their 1987 concealed carry law has lead to growing popularity for the movement. This “novel social and economic experiment” created a domino effect across the country in which restrictive statutes obstructing the right to bear arms have fallen one after the other, leading to greater security for society at large. 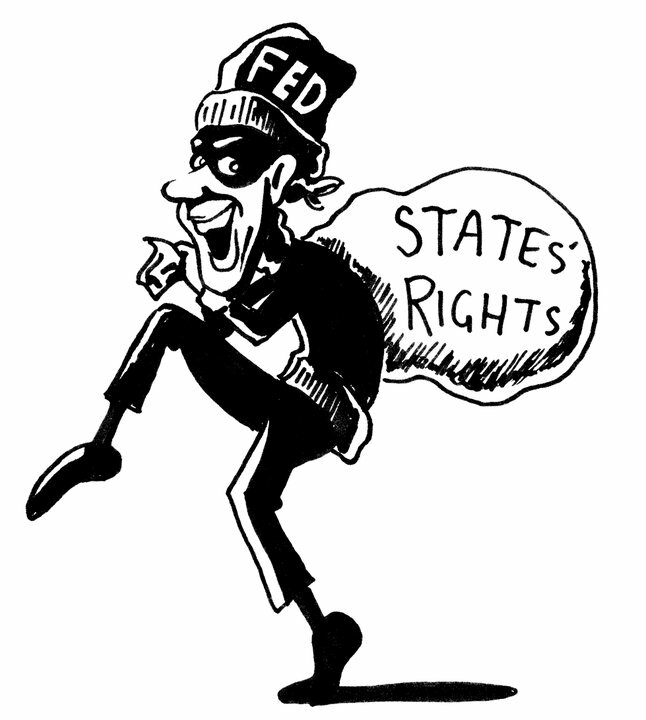 Best of all, both movements gained political popularity through voluntary means with states enacting the laws of their own initiative, rather having it shoved down their throats through federal thuggery. In Plato’s dialogue Crito, Socrates makes a famous contribution to political theory on the nature of governmental consent. Condemned to death by an Athenian jury, the philosopher refuses to flee his jail cell under the rationale that he had “entered into an implied contract” to obey the city’s policies. After all, the Ancient Greek reasons, if he were dissatisfied with their laws, he was “at liberty to leave the city” and move to a jurisdiction he found more agreeable. Ideally under the Constitution, states would function in a similar way, allowing Americans the liberty to move to the state they find to have their favorite flavor or policy. Unfortunately, with the federal leviathan strangling states’ rights today, Americans cannot escape its dissatisfying grip of mandates and regulations regardless of where they live. However, if Washington would pay greater respect to the Constitution and therefore states’ rights, Americans would have greater choice and voice in policymaking and, consequently, greater satisfaction.